This is the route of Sussex County's first railroad to transport coal from Andover mines to Waterloo Village, with parts of the earliest mule-driven line looping off the current route. 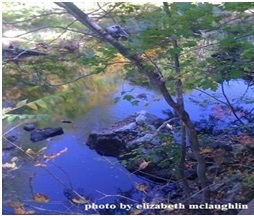 The Sussex Branch Trail is 22 miles in total. It is enjoyed by hikers, bikers and equestrian riders as well. Exit 25 off of Route 80, take Route 206 North. At the intersection of Route 206 and Waterloo Rd. (traffic light), turn left onto Waterloo Rd. (County Road 604) for about 1 mile. The parking lot is on the right across from Continental Drive. 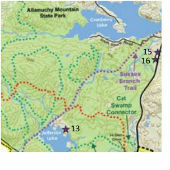 The Sussex Branch Trail begins in Allamuchy Mountain State Park and extends approximately 21 miles from Byram Township into Branchville. This smooth, wide and straight trail passes through fields and forests, along lakes and streams, sometimes following or crossing over main roads and areas where the right-of-way lies along the property of private individuals. It runs through two state parks, Allamuchy Mountain and Kittatinny Valley. The section in Byram is approximately 4 miles long. Heading north toward Andover Borough, you'll see a section of the Lackawanna Railroad Cutoff built in 1911. The cutoff is a 28 mile long, man-made ridge of rock that shortened and straightened the Lackawanna Railroad into Pennsylvania. The Sussex Branch runs through its only tunnel in this location. The trail has a very interesting history and was once the mule-drawn Sussex Mine Railroad built in the late 1840's, whose primary purpose was hauling iron ore from the mines in Andover to Waterloo Village. By 1869, the Sussex Railroad also became a freight and passenger business and expanded as a way to reach Newton then Branchville. In the mid 1960's it shut down totally. Between 1979 and 1982, NJ Dept. 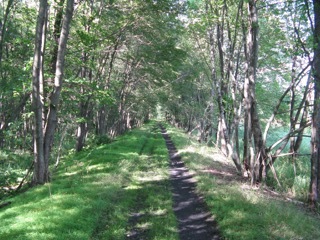 of Environmental Protection purchased the abandoned Sussex Branch Railroad and this trail is now managed by the NJ Division of Parks and Forestry.